Do you have a friend, family member, colleague, acquaintance, neighbour who might be interested in getting a new website? Be rewarded for referring them to Aspired Technology and allowing us the opportunity of creating a brand new website for them. Simply fill in a form on our website and if they then sign up for a basic package or CMS package, you will earn yourself a $50 Bunnings or Woolworths Gift card. Fill in the form on our Refer-a-friend page on our website. Compete form with your details and the details of your friend. Your friend then signs up to a new website package (basic package or CMS packages). 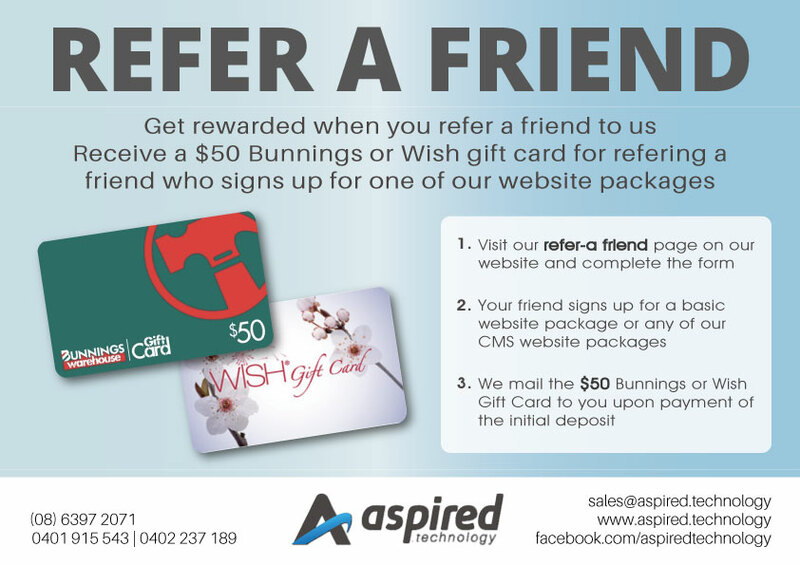 When the initial deposit is paid, we will then post you a $50 Bunnings or $50 Wish Gift card (your choice).